Many RDF repositories have already been implemented with various access languages and mechanisms. The aim of the EDUTELLA framework is to allow communication between different RDF repository implementations. Part of EDUTELLA is a Query Exchange Language (QEL) which can be used as lingua franca to retrieve information from RDF repositories. This work shows why we also need standardization of distributed modification capabilities. We describe use case scenarios for annotation and replication services and use them as guideline for our approach towards a Modification Exchange Language (MEL) for distributed RDF repositories. 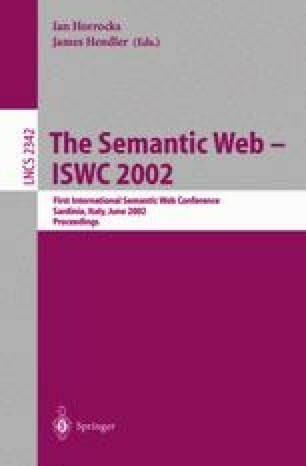 The Karlsruhe Ontology and Semantic Web Tool Suite. http://kaon.aifb.uni-karlsruhe.de, 2001. J. Merrells, E, Reed, U. Srinivasan. LDAP Replication Architecture. IETF Internet Draft. http://www.ietf.org/internet-drafts/draft-ietf-ldup-model-06.txt, 2000. R. V. Guha. RDFDB QL. http://web1.guha.com/rdfdb/query.html. Andy Seaborne. RDQL-RDF Data Query Language. http://hpl.hp.com/semweb/rdql.html, 2001. Brian McBride. Jena: Implementing the RDF Model and Syntax Specification. http://www-uk.hpl.hp.com/people/bwm/papers/20001221-paper/, 2000. L. Miller. Inkling: RDF query using SquishQL. http://swordfish.rdfweb.org/rdfquery/ 2001.